Many California residents, along with countless others across the country, are struggling to make ends meet. If you're barely paying monthly credit card minimums and living paycheck to paycheck, you might be looking for government assistance to bridge the gap between expenses and income. While local and state agencies do provide a measure of emergency assistance for low-income families - there is no state or federal program in place to help provide consumers relief from credit card debt. The types of relief extended to banks and other financial institutions in recent years in the form of bailouts and loans unfortunately do not extend to individuals and families. However, a variety of debt relief options are available to consumers who get in over their heads in debt. These options include debt consolidation, debt management plans (DMPs) coordinated by credit counselors, debt settlement or negotiation, or even bankruptcy. 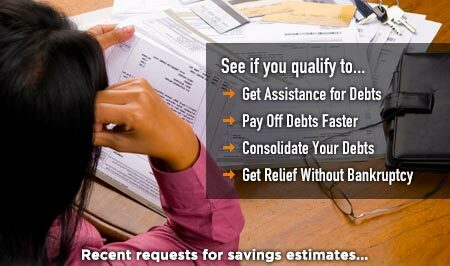 Get a free debt relief analysis and savings estimate. While all consumers bear the responsibility for paying off credit cards and other debts they incur, in recent years, aggressive credit card company policies have, in part, contributed to the increasing level of credit card debt facing Americans. As a result, the the Credit Card Accountability Responsibility and Disclosure Act of 2009 is a federal statute passed and signed into law by President Barack Obama on May 22, 2009. Approximately nine months later, February 22, 2010, the bill went into full effect. While the Credit Card Act of 2009 does not place restrictions or controls on credit card company pricing, interest rate caps, or fees - it does provide some strong provisions and protections to help consumers. This government debt help legislation is a proactive measure that can help provide a first-line-of-defense against credit card debt. It is aimed at addressing the credit card debt problem at its source, beginning with the actual policies and often confusing, hard to read terms contained in cardholder agreements. The legislation was enacted due to the fact that many citizens and many in Congress believed that the credit card company revolving debt machine had gotten out of hand. Arbitrary rate increases, failure to give significant advance notice of rate increases, hard-to-decipher credit card company disclosures and agreements, and a very harsh credit card company practice called Universal Default, were just some of the factors contributing to the debt epidemic. Therefore, it is now mandatory, through the Credit Card Act of 2009, that credit card companies give 45 days advance notice of a rate increase. If the cardholder chooses to cancel the card in question, they are allowed to pay off the balance at the older, existing rate, not at the new higher rate. In addition, credit card companies no longer are allowed to retroactively increase interest rates on the balance of a cardholder in good standing for reasons that have nothing to do with the cardholder's payment record with that particular card. In past years, credit card agreements that included the Universal Default provision allowed credit card companies to hike up rates suddenly, at the sign of any change at all in the credit "profile" of the individual. Therefore, consumers with credit cards that included the Universal Default provision could be paying a 10% interest rate on a card and have a perfect payment record with that particular card, but if the consumer applied for credit, bought a car, or even became late on a different credit card - the card that you had a perfect record with could assess those events, totally unrelated to your payment record with them, and legally hike interest rates from 10% to up to 29% or higher. This practice was known have been a predatory practice by credit card companies, as it dealt a crushing blow to many consumers, many of whom were already deep in debt. So, while the government does not provide credit card debt relief grants, debt management, debt consolidation aid, or special programs to bail out everyday consumers from their debt, these provisions and others from the Credit Card Act of 2009 have been a positive step to help consumers avoid the trap of credit card debt in the first place. If you are struggling with credit cards and other unsecured debts get a free debt relief analysis and savings estimate. In addition to credit card relief legislation, the government has also stepped up to help consumers who have been hit by the sub-prime credit meltdown. The United States Department of Housing and Urban Development (HUD) assists consumers via a program call the FHA Secure loan program. This helps provide aid for homeowners who are facing possible foreclosure and may need to refinance a subprime credit mortgage. Another area where the government is helping to provide consumers with debt relief is in the area of federal student loan debt consolidation. This program may allow debtors to consolidate all federal student loans into a single, lower interest rate loan and make a single, easier payment each month. It is important to note that this loan consolidation program only applies to federal student loans and not privately funded loans. For more information and assistance, go to the U.S. Department of Education's Federal Student Aid page. In addition to federal economic relief aid, the state of California also has a variety of programs available to help consumers in need of relief. California, similar to the federal government, California does not have credit card relief programs, grants, or consolidation loans to help consumers pay off their credit card debt obligations. However, for individuals who are struggling - including low income families, the elderly, and those needing medical assistance the state does offer several areas of support. To learn more about these services, go to the state's homepage and click on the Benefits page. 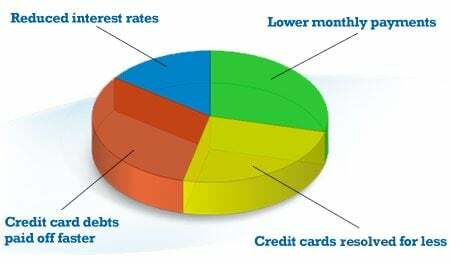 If you are in need of relief from credit cards and other unsecured debts, you can get a free debt relief analysis and savings estimate at no obligation. Begin online by answering a few questions regarding your financial situation.